Waheeda Rehman recently voiced at Usha presents Mountain Echoes, that ” The role of women is changing in Hindi cinema, but we need more graceful, stronger characters.” Well, the aging Star got her wish in Priyanka’s portrayal of the World Boxing Champion Magnificent Mary, in the upcoming movie Mary Kom! If wishes were horses, we believe they would soon be running up the list of best performances (Fingers Crossed). In retrospective Waheeda Rehman’s conversation with Arshia Sattar at the Bhutan Literary Festival had many other subtle associations on the changing role of Indian Women in Bollywood, which can be associated with the MC Mary Kom’s upcoming biopic. For instances Waheedaji hated most the Make-up ritual of the whole acting experience, carrying with her only a small mirror that simply reflected her eyes (By the way Rishi Kapoor had the biggest life size mirror during those Golden days of dramatic cinema). And here we have Priyanka with toned muscles and a look that would put many professional boxers to shame: Make-up doesn’t’ do that to you, hard work does. Thumbs up to Priyanka! 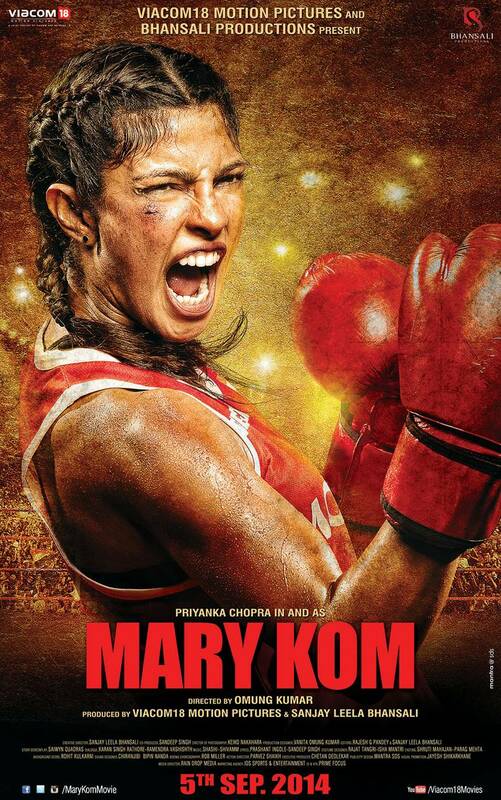 And o’course to Mary Kom without whom nothing would have been possible. Both the actors, the graceful Waheeda and the pretty – make that – pretty powerful Priyanka Chopra will have another thing in common: After the ‘Actions’ and Pack Up’s’ their roles will linger in the recesses of their minds long after, for once. Waheeda Rehman mentioned “I usually step out of character once they say, Pack up! Sometimes, I end up feeling low and heavy. It happened with Khamoshi.” We wonder what it’s going to be like for Priyanka Chopra, after all playing a legend, a boxing champion, and a mother of two from Northeast India, is a Raging Bull of an experience and no easy job. For more of Waheeda’s thoughts, anecdotes and juicy secrets from the Usha presents Mountain Echoes 2014 watch the video below; as she, among many other things notes that unlike the twin roles of the vamp and the innocent heroine of the good old nostalgic days, both have merged into one today. When asked about her favourite contemporary Bollywood actresses Waheeda Rehman listed out a few names from Tabu to Sri Devi, think she will have to add Priyanka Chopra to that list after Mary Kom boxes the office out, both commercially and critically! This entry was posted in Art & Culture, Inspired Life, Our Initiatives, Sports and tagged Bollywood, History, Mary Kom, Mountain Echoes, Movies, Sports by Blogger. Bookmark the permalink.